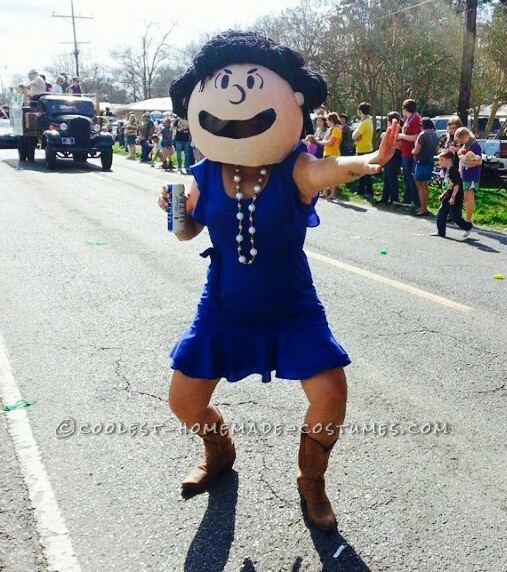 It began with an idea, the idea of a Peanuts gang style Mardi Gras float for the annual Lavonia Mardi Gras parade. The first idea turned out to be “not so smart” as we attempted to make the heads out of paper mache’ over balloons. The balloons burst in our faces, spreading wet, soggy paper mache’ from one end of the house to the other, including the ceiling fan and all of our faces! Our first attempt at the paper mache’ was using a store bought product. This did not give us the stability we needed to cover the balloons. Plan B. Unable to accept defeat, we carried on using a much stronger base… Walmart bouncy balls, and a home made recipe for the paper mache’. This was not all that easy to make, and we smelled like bleach for days. This homemade recipe gave us the strong, smooth Charlie Brown type head we were going for. Now, this worked well, but trying to deflate the balls to extract them from the hardened round heads was not so fun. SUCCESS! 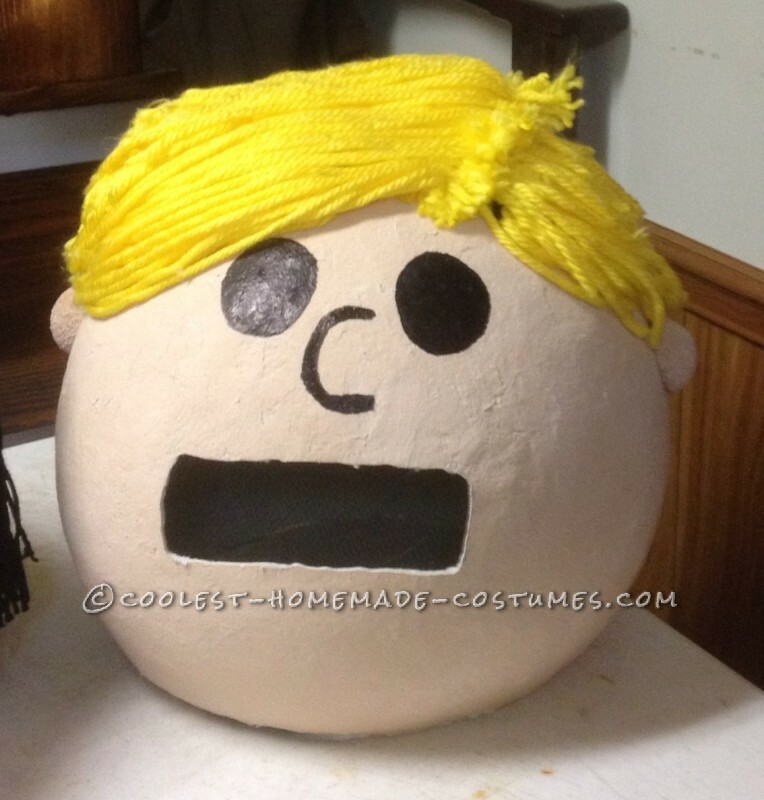 Now that we had 13 round, hard paper mache’ heads and the real fun began. 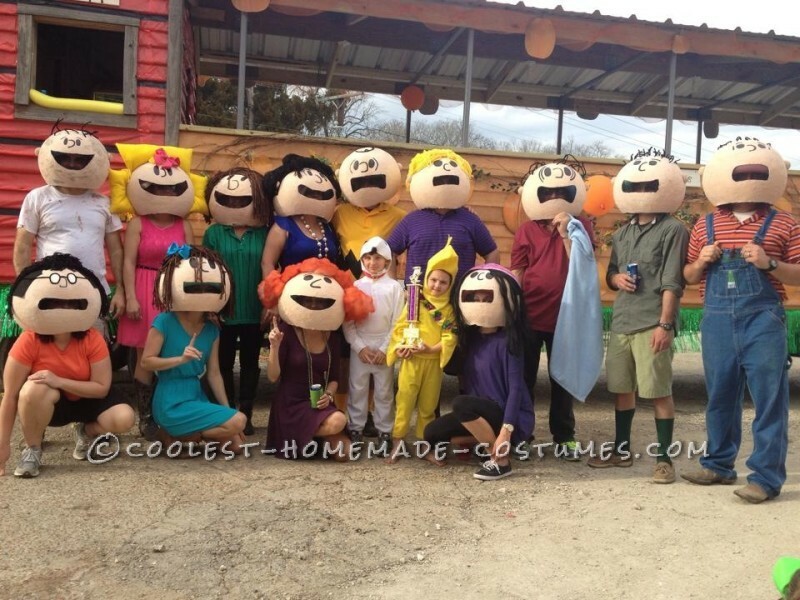 Using everything under the sun, we managed to decorate each peanut head with faces, large mouths ( for seeing and breathing) and hair.. oh boy, the hair was fun. We used yarn, felt, pillows, hats and anything else the cat dragged in. Cutting out the mouths ran from using a utility knife, not the best idea, to a dremel type tool. Talk about making a mess. This process ran for many weeks, with help coming and going. The “trial runs” were so much fun as we danced around the yard with the unfinished heads on to see how they (or us) would hold up. The end result… Happy Mardi Gras parade goers, and 1st place in the parade contest. But, the fun we had from conception to the big day, was worth all of the mess and failures, it was all about the time spent with family and friends!